The Canon T2i with Vivitar 7mm Fisheye lens test. Around Honolulu. Come along and ride on a fantastic voyage! We took a ride in Aaron's G35 while Shermz took the pilot seat and Aaron desperately holding the camera and laptop with heavy clutching going on, SCENEFIFTY style...LOL! We tested Aaron's new Vivitar 7mm Fisheye lens on his Canon T2i and went cruising around down Pali Road, downtown Honolulu, through Waikiki and the far east side of Oahu. Take a trip! The Dos-R DIY camera rig. With a mindset of building knowledge and talent, Ryan took a whole lot of scratch building materials, parts, tools, Macgyver skills and time to build a DIY slider rig for a video camera. 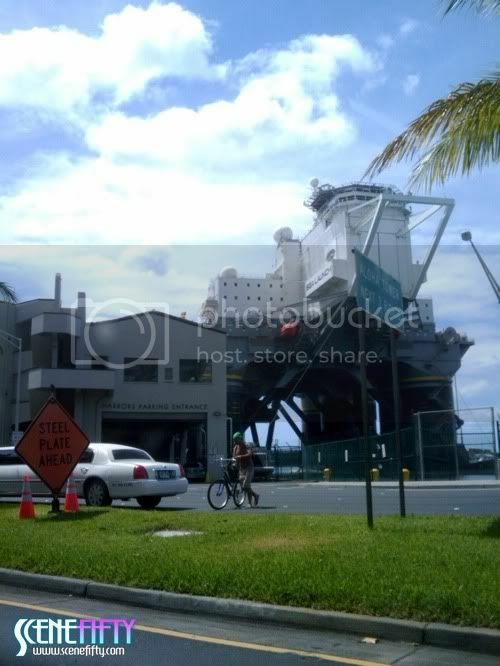 Passed through downtown Honolulu earlier today and a massive structure pulls into dock like nobody's business! Actually, it's a mobile sea platform that actually fires rockets into the sky from the ocean! It was 1 of 3 massive floating structures docked in Honolulu Harbor, 2 being massive cruise ships. Have you seen the DOUBLE RAINBOW yet? OMG, OMG, OMG! If you haven't seen it yet, prepare to LOL, scratch your head or dig in your thoughts on why the guy in the video was tripping out on this double rainbow. To me, I thought it was kinda hilarious. Well here you go, I liked the auto-tune remixed version...so I posted it. Prepare to get intense! Hamm-Hop! The new KIA Soul commercial is Hip Hop win! I've seen this commercial on the HDTV the other day and loved it! The hamster hip hop version of Black Sheep's "The Choice is Yours" featuring the new KIA Soul got me rolling lol!